Notes: This station, authorised on 2 November 1893 at £1,080, replaced the North Eastern Railway’s first station which lay 11ch north – see Ryhope (1st) NER. It stood about 100yd west of the Londonderry Railway (Seaham & Sunderland Railway) station (later known as Ryhope East). Sinclair (1985) gives the opening date as 1894. Ryhope station was immediately south-west of the bridge where Robson Place passed under the railway, having been diverted from crossing the line on the level. The station’s two facing platforms were about 210yd in length. The principal passenger building was on the down (Sunderland-bound) platform. Its design resembled that at Prudhoe (1884) consisting of a plain single-storey, brick-built structure under a slate pitched roof, with wings projecting onto the platform at each end. Between the wings was a verandah enclosed by a glazed, timber screen. The building contained the station offices and waiting rooms. On the opposite platform was a pent-roofed timber structure containing waiting and toilet facilities. At the north-east end of this platform was the stationmaster’s house, a dull two-storey affair in brick with a slightly overhanging pitched roof. Also at this end of the platforms was a standard, curved profile NER footbridge. This was a graceful design made up of cast iron parts which was erected on site. The castings were lettered and numbered to facilitate assembly. Regrettably, the original standard drawing for these bridges is undated, but they appeared at many NER stations in the late nineteenth century. Access to the footbridge was provided both from the platforms and the road side. It is not certain who was stationmaster when this station opened, but it was possibly Mr R Lumley who transferred to Beamish from Ryhope on 3 December 1903. On the same date the stationmaster at neighbouring Ryhope East left his post and henceforth both stations were administratively treated as one, sharing a stationmaster, and their bookings statistics appear to have been combined. On 3 December 1903 Thomas Lish moved from his stationmaster’s post at Leadgate to take on this role at Ryhope which he held until 20 February 1925. NER records reveal that in 1911 the Ryhope stations served 11,236 people and issued 138,568 tickets. The goods traffic (handled in sidings placed between the diverging tracks of the former D&S and Londonderry routes) in 1913 amounted to 1,476 tons of scrap iron and steel and 27 vans of livestock. The RCH Handbook (1904) refers to a 1-ton 10cwt capacity crane and sidings serving Ryhope Colliery & Brickworks and Silksworth Colliery & Depot. There was no goods warehouse at the station. The October 1912 timetable shows a more frequent service on Saturday than on other weekdays; this feature would be seen in later timetables too. Since 1905 the new coastal route through Seaham and Horden provided a far more direct journey between Sunderland, West Hartlepool and Middlesbrough but it will be seen that the service via Ryhope was maintained. Two up trains are shown with Durham (Elvet) as their destination; Elvet replaced the original Durham terminus at Shincliffe (Town) in 1893. Passengers from Ryhope travelling to Durham would normally change trains for the branch at Murton. In 1931 the passenger service on the Durham (Elvet) branch was cut back to Pittington, although excursion trains (including the annual Durham Miners’ Gala specials) continued to be handled at Elvet station. The September 1937 timetable shows that a frequent weekday service of through trains from Sunderland now operates to Pittington (or to Hetton – the station before Pittington) and on weekdays the interval for much of the day is hourly, with a similar frequency of trains to West Hartlepool though at less regular intervals. Sunday train services are, however, sparse. The 1920s and ‘30s saw increased competition offered by road motor transport, notably buses in this area where car ownership was probably not high. In May 1931, for example, Northern operated a quarter-hourly weekday bus service between Sunderland and West Hartlepool (half-hourly on Sunday) and Sunderland District Omnibus Co provided hourly services every day. 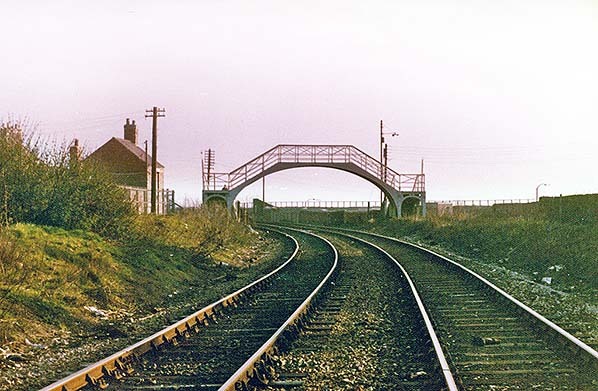 Northern also ran a half-hourly service between Sunderland, Ryhope, Murton, Haswell and Thornley – all with stations on the old Sunderland – West Hartlepool railway. Intending passengers enjoyed generous provision of public transport at this time. The notion of buses competing with the trains is somewhat misleading as the Railway (Road Transport) Act of 1928 was promoted by the four big ‘grouping’ railway companies to allow them to operate buses; and under a subsequent agreement made with existing bus interests, railway companies were permitted to acquire up to 50% of the shares in bus companies. The LNER took advantage of this and acquired a financial stake, for instance, in Northern and in Sunderland and District (who provided ‘competing’ buses – see above) as well as United. During World War 2 the Monday-to-Friday train service was curtailed, as seen below in June 1943 but, particularly on the Pittington branch, Saturday trains were reasonably frequent later in the day. After the war the enhanced Saturday train service to and from the Pittington / Hetton branch continued in summer 1946 but by winter 1947 fewer trains operated. On 1 January 1948 most of the railway network in Great Britain was nationalised as British Railways (BR) and the Ryhope stations were allocated to the North Eastern Region (NE). Mr H R Peacock is thought to have been stationmaster at this time. After his death in service on 23 June 1951 it is likely that he was succeeded by Mr H J Millett who held the post until December 1955 when he was transferred to Longwood & Milnsbridge. In an interesting turn of events the infrequent train service through Ryhope was boosted in 1949/50 on weekdays to an hourly departure for Hetton, with a few trains continuing to Pittington, and several trains to West Hartlepool, but there was no Sunday service. As before there were a few more departures on Saturday than on Monday-to-Friday. Ryhope station retained an essentially Victorian character in British Railways’ days: electric lighting was not installed and BR signage never appeared. Having experimented with different levels of passenger service BR identified the Sunderland – Pittington and Sunderland – Wellfield – West Hartlepool lines as uneconomic. In 1951 the two Ryhope stations together issued only 6,917 tickets. The passenger service between Murton and West Hartlepool was withdrawn on 9 June 1952, although it was still incorrectly included in the summer 1952 timetable. 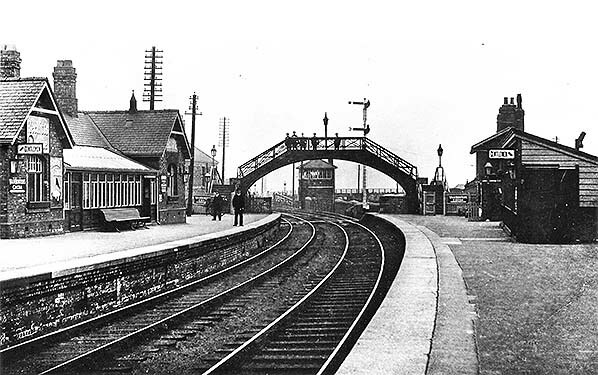 The Sunderland – Pittington service continued for some months, but as seen on several of its loss-making lines in the early 1950s, BR(NE) closed one station (Seaton) shortly to be followed by the entire line; Menthorpe Gate, Ampleforth and Hampsthwaite stations in Yorkshire illustrate this feature. 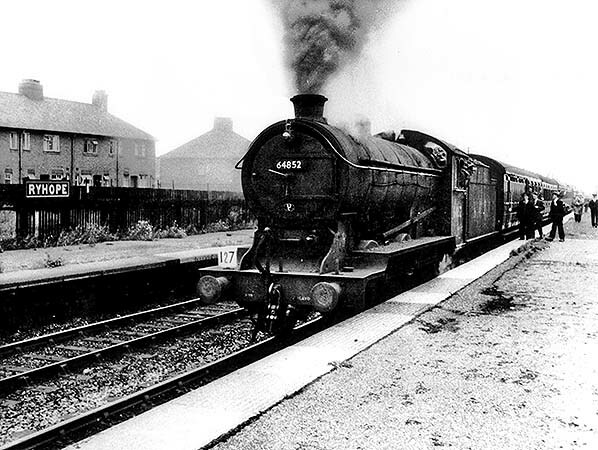 Passenger services were withdrawn from Seaton station on 1 September 1952 to be followed by the route from Ryhope Grange Junction to Pittington on 5 January 1953. The line through Ryhope remained busy with coal traffic and the station’s goods facility (shared with Ryhope East) continued to operate. Ryhope East was to remain open to passengers until 7 March 1960. On this date Ryhope goods was renamed Ryhope East and it eventually closed on 1 June 1964. 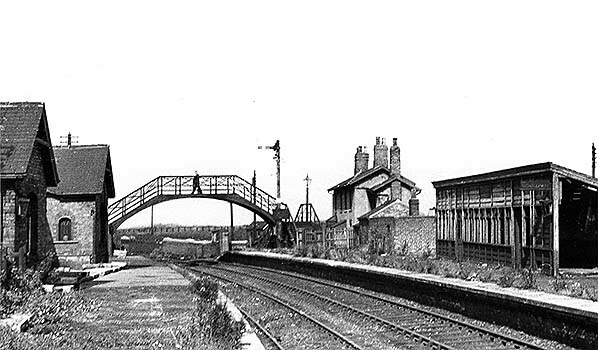 Ryhope station had been demolished by 1977 with the exception of the footbridge. The line through the station was used by coal trains from Murton Colliery until the closure of this pit in November 1991; the date of track-lifting is not known. 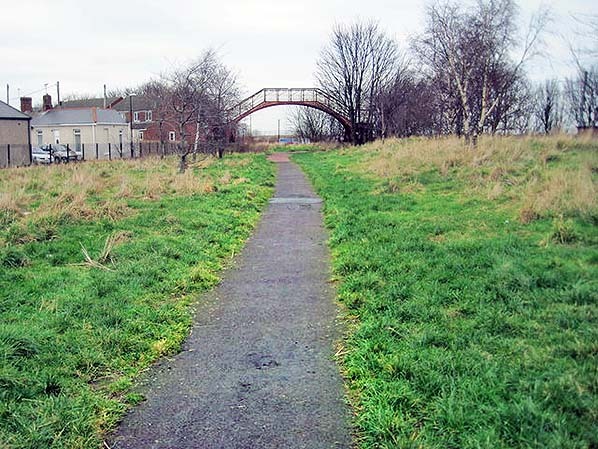 Today almost the entire former Ryhope Grange Junction – Wellfield – Hart (West Hartlepool) railway is a traffic-free cycle route, one of many old railway trackbeds in County Durham providing recreational rights of way. At Ryhope the distinctive NER footbridge is all that remains of the station, with staircases on the north-east side only. 1897 OS 1: 2,500 map. The first station site (see 1st NER and 1st LR station pages) is no longer named and two separate Ryhope stations are drawn in detail. A building adjacent to the site of the original NER station is marked with a gated track approaching it from the south. The new Ryhope NER station’s platforms are shown clearly, with the main building on the up platform adjacent to George Street. On the down platform a waiting shed is shown with the stationmaster’s house to the north. A footbridge is at the north-eastern end of the station for use by passengers wishing to change platforms and a set of steps at each end allows pedestrians on the road crossing the railway to use it; this arrangement was presumably provided before Robson Place was diverted from crossing the line at the level to diving under it. 1920 OS 1: 2,500 map. Ryhope is identified simply as ‘Station’. The main building is shown with twin pavilions embracing a glazed verandah. 1953-54 OS 1: 2,500 map. Ryhope station closed to passengers in January 1953. The platforms and buildings are complete. Although the station appears never officially to be known as Ryhope ‘West’ the building at the north end of the down platform is described as ‘West Station House’. Looking north-east along the down platform of Ryhope station in 1950. The locomotive on the three-coach passenger train is an 0-4-4 ex-NER Class ‘O’, later LNER/BR Class G5; unfortunately, its number is illegible. 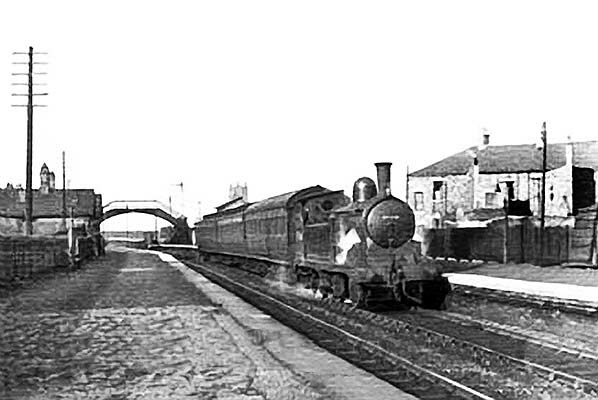 In July 1952 an excursion from Durham (Elvet) is arriving at Ryhope station. Although the Elvet terminus had closed to regular passenger traffic in January 1931 it continued to be used by specials, notably on Durham Miners’ Gala days, until July 1953; the train seen here is possibly such a Gala day service. The J39 0-6-0 Gresley-designed loco was built by the LNER at Darlington works in March 1934. At first numbered 1472 she was renumbered 4852, receiving the ‘6’ prefix after nationalisation. The loco was withdrawn from 52B, Heaton shed, in December 1962 and was subsequently cut up. Ryhope station looking north-east in August 1958. The station has been closed to passengers for over five years but goods continue to be handled in sidings beyond the footbridge. Weeds are colonising the platforms and the up (right) platform building is derelict; the gents’ toilet at the near end has been removed leaving the wall of the shelter open to the elements. The main building (left) is probably derelict too. It is not known whether the station house is still occupied. The fine NER footbridge remains intact, as it does today. Looking north-east at the site of Ryhope station in April 1977. The station has been demolished but the NER footbridge remains intact; its south-western pair of staircases has been removed. 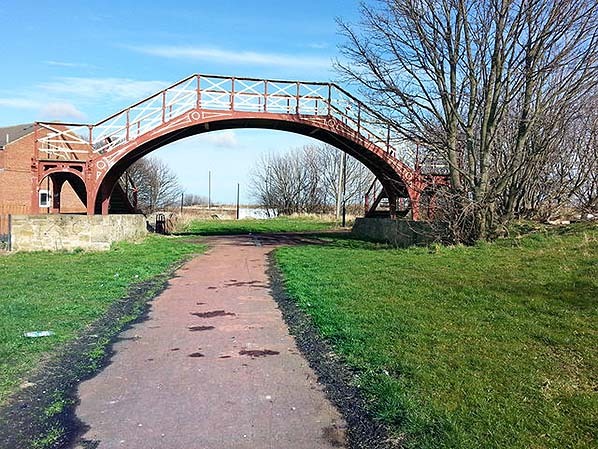 The NER footbridge is the only surviving structure at Ryhope station; it is in good order and smartly painted. This view is looking north-east along the trackbed in March 2014. 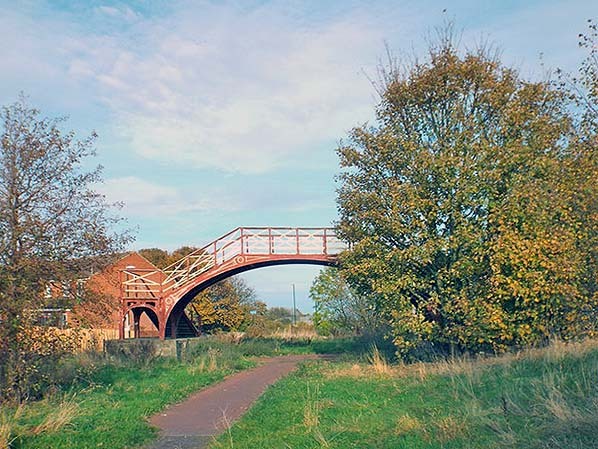 The NER footbridge is the only surviving structure at Ryhope station. This view is looking north-east along the trackbed in October 2016. The site of Ryhope station, looking north-east in January 2017. At the far end of the former station the distinctive NER footbridge is still in place.